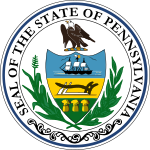 The 1840 United States presidential election in Pennsylvania took place between October 30 and December 2, 1840, as part of the 1840 United States presidential election. Voters chose 30 representatives, or electors to the Electoral College, who voted for President and Vice President. Pennsylvania voted for Whig challenger William Henry Harrison over Democratic incumbent Martin Van Buren by just 334 votes, a margin of 0.12%. It is the narrowest margin of victory in a presidential election in Pennsylvania history, with Donald Trump's 2016 win following close behind at 0.72%. 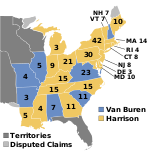 ^ "1840 Presidential General Election Results - Pennsylvania". U.S. Election Atlas. Retrieved 4 August 2012. This page was last edited on 14 December 2018, at 16:51 (UTC).